John Henry Goldthorpe was the third son of James Goldthorp and Grace Horn.John married Ann Maude Boyes. They had three sons Albert Edward, Harry, and Arthur, and one daughter Iris. Albert married Florence Phobe Lee. Harry married Lilly Todd. 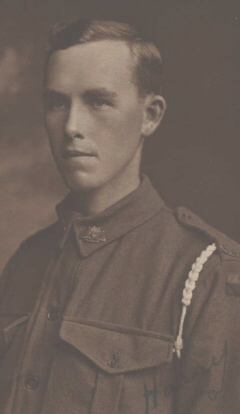 Arthur was killed at Gallipoli during the great war. Iris married Francis Green and later married Norman Arthur Jacobs. This branch of the family is in Australia. This photograph of Harry was taken in 1918 whilst he was serving with the ANZC force in France.Harry moved to New Zealand in 1937, married Lilly, worked in a dairy factory, and he died in 1967. Information would be welcomed as to the whereabouts of Private Arthur Goldthorpe of the 18th Battalion, 5th Infantry Brigade, Australian Expeditonary Force. Goldthorpe, who is not yet 18 years old, is the son of Mr John Goldthorpe and a nephew of Mr A E Goldthorpe the famous Hunslet footballer. The battalion was engaged at Suvla Bay and he was reported as wounded and missing.